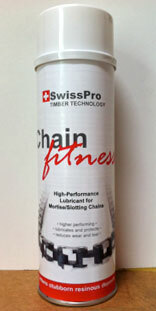 "Chain Fitness" chain lube penetrates & gels. 500 ml can. "Chain Fitness" chain lube - 12 x 500 ml cans - Save! Use our chain sharpening service to keep the proper pitch and correct angle for the maximum life of the edge. We also carry chain sharpening machines, especially designed for sharpening mortise and slotter chains with the proper pitch and angle. If you run a sharpening service, call us for proper profile information! And when it comes time to replace your mortise or slotter chain, we have the best selection. If time is of the essence, you can send chains by Express overnight or 2nd day, but it is a fairly costly affair. Otherwise, count on a 2 week turn-around time at the maximum. For our American customers, the cheapest route is by flat rate mail (Priority Post). 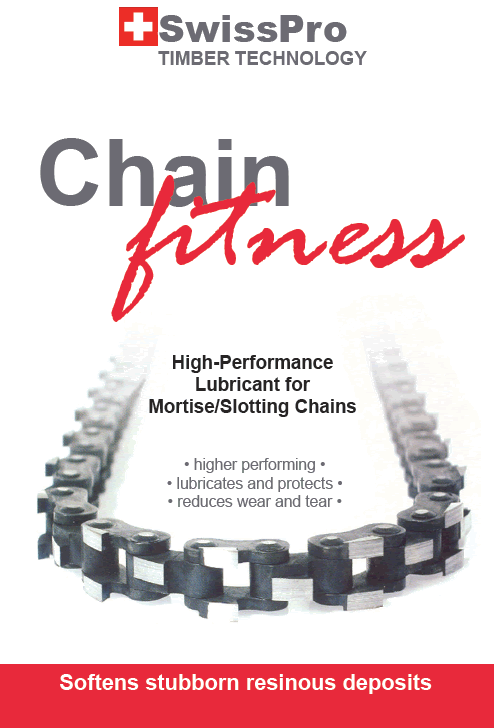 The cost for sharpening of a mortise chain starts at $25.00 each. As we have received deliveries of packages without the chains (the chains having chewed through the wrapping), we strongly recommend that you wrap the chains tightly in sheets of plastic or heavy paper material. If only one chain is sent, you could put some cardboard around it. Fit it into a matching size of flat-rate box from the US post office, making sure to stuff the box, such that the chain cannot flap around loosely inside the box, as it will eventually chew through it. Tape all around it once from side to side and across. Send by priority mail with delivery receipt and/or at least $100 insurance. That way you can track it, and it never seems to get lost. Website design by HolmPage Call us for more information or to order at 1-800-350-8176.